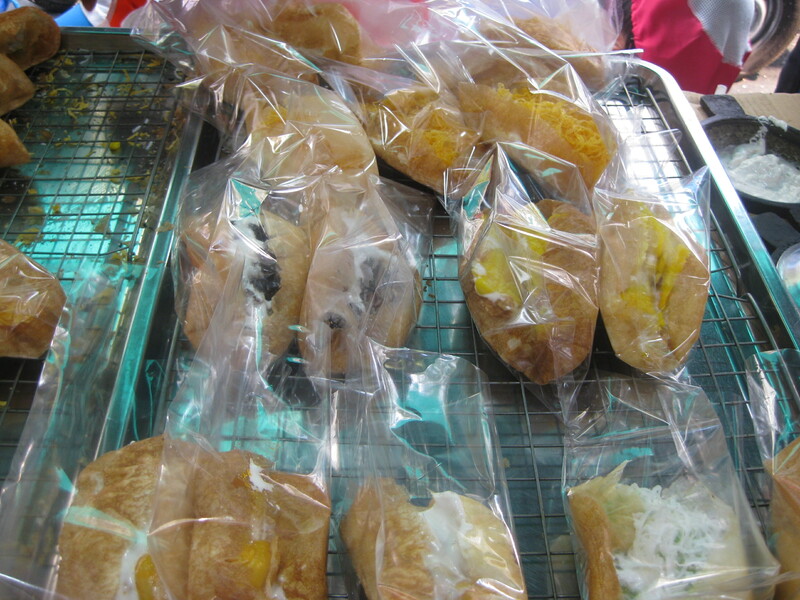 This street vendor (above) was selling “dessert tacos” consisting of fried bread wapped around a sweet coconut filling, with cream on top. Very, very sweet. The dining options at the Floating Market were incredible. The catfish in the picture above was skewered with lemongrass and then tossed onto an open grill, and served with a spicy yet cool green sauce, along with the ever-present garnishes like lettuce, basil leaves, etc. This item was on a dessert menu in Chian Mai. The dumplings were made out of steamed buns, which have a rubbery texture and no flavor. Inside the dumpling was sesame paste, which is like bitter peanut butter without the smoothness. The whole dumpling was sitting in a sweetened, hot ginger tea. I was not a fan of this dish, and neither was anyone at the table. Raw tamarind, either dusted in peanuts, plum powder or fried, is a common snack sold by street vendors. It is extremely tangy, of course, and very good. One of the best meals I’ve had couldn’t have been simpler: Prawns with pepper and fried garlic. In fact, I didn’t order it because it sounded boring to me. The fried garlic, howevver, was unlike any I’d ever had. It was shaved garlic which fried into golden crisps. The prawns were served in approximately two cups’ worth of this garlic, after having been marinated in it as well. It was amazing. I ate every bit of that garlic and plan to copy the dish as soon as I get home. It seems the breakfast as a separate meal with separate dishes is not a Thai concept. The same dishes are eaten at breakfast as at other times of the day – noodles, curries, etc. 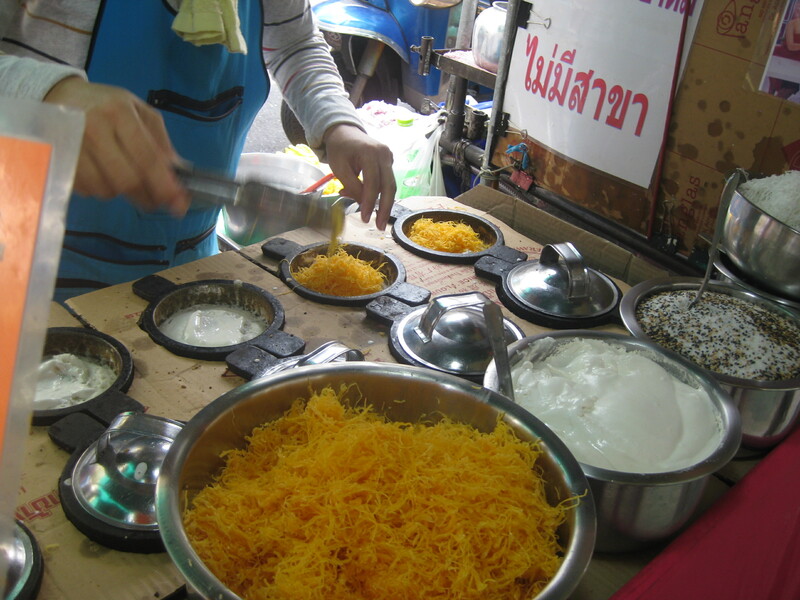 However, we did find one Thai breakfast place, which in addition to eggs and sausage served a coconut milk custard, presented with squares of white bread for dipping. I don’t know the name of this dish and haven’t been able to find it online. It consisted of cashews, chicken (lightly fried), red chilis, basil leaves, lettuce and a black boiled egg. The egg was translucent, varying in color from black to purple. It was rather pretty. I don’t know if it was pickled or boiled in some substance. The dish as a whole was so spicy that one bite felt like being punched in the mouth. I couldn’t actually discern the flavor of the egg underneath the physical agony, so I don’t know if I would enjoy a less-spicy verion of this dish. The dish above is meatball skewered on lemongrass with a red chili dipping sauce. These are only the dishes that had definite names; I’ve had many more delicious dishes whose names I never discovered, particularly at the street markets. One notable noodle dish was at the market near Srirat Hospital. The stall owner had about a hundred bowls sitting out, each filled with a chili-and-oil sauce. When a customer arrived, she would grab one and fill it with the noodles, broth and beef, which had been sitting in another dish. Each bowl came with a side bowl of garnish: lemon, basil leaves, lettuce. I guess that she let the bowls sit all day, growing spicier and spicier. I wish I’d taken a picture so I could better figure out what was in the oil-and-chili combination. “The dish as a whole was so spicy that one bite felt like being punched in the mouth.” Sounds like my kind of dish! Is there any kind of sweet tea that people drink to stop the burning?